Part minimalist human drama, part surreal fantasy, Oblivion Verses is kind of movie Kiarostami would’ve made if he were high on acid. In his screenwriting book, Robert Mckee says that story is a metaphor for life. But can a story be a metaphor for death? Every grave has a story to tell. This is the story of an elderly morgue attendant whose sole purpose in life is to give meaning to death. Many films deal with the concept of death. But in Khatami’s astounding debut, death is the conclusion of a story. Our unnamed protagonist lives in the graveyard. He not only preserves the body of the dead, he preserves their stories, their world. When a body is buried, a world comes to an end. The morgue attendant, along with his blind friend, narrates the story of the dead while digging the grave. They’ve buried around thousand corpses and collected thousands of stories. A man takes the bus never to return, a prisoner writes letters to the cousin he married, an old man in exile sees his long-lost daughter just before dying, a woman is waiting for death. Perhaps the film is a burial ground of past trauma. In process of making a deeply personal film director is also embalming the memories of past he had forgotten. In a world where people don’t care about the living, the old man has compassion for corpses. He believes that everyone deserves a proper burial. He believes that it’s an absolute tragedy to be buried without stories, without a name. His mundane world is disturbed when a bunch of goons breaks in looking for a place to dump bodies. Conveniently, they stumble across old man’s defunct morgue with empty cold storage. For corrupt politicians, an unclaimed dead body is just a thing they need to get rid of, but old man treats her like his own dead daughter and produces a fake birth certificate to acquire a permit to bury her. He risks his own life to give a proper funeral to an unknown dead. In a consumerist society, there is no place for human values. A funeral is a privilege that only rich can afford. Graveyards are not permanent, eternity only lasts for a decade. Old man’s funeral notice is printed on the other side of an election campaign advertisement full of empty promises. It shows how politics interfere even in the matter of death. The stack of funeral notice is blown away by the wind as if nature itself is opposing the noble cause of old man. The whale is a recurring metaphor in the movie. A news reporter is covering the story of seven whales who stranded on the beach. Why would one of the most intelligent mammals on the earth attempt suicide? Whales are not that mysterious after all. They too mourn the loss of loved ones. They cling to the body of a dead calf. The old man gives a whale-shaped earring to the dead girl as if giving meaning to her death. 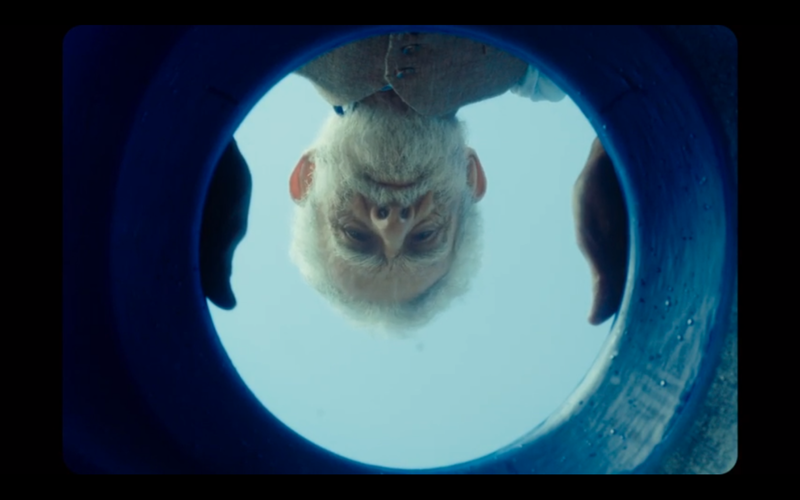 In one of the most bizarre scene, the old man is looking at a gigantic flying whale out of the window. Dazzling as it is, I fail to comprehend the meaning of that scene. Maybe the whale represents the death, maybe the whale represents our collective grief. The film is full of surreal imagery. For instance, the giant hand in the middle of the desert or the police officers devoured by the shelf of books. 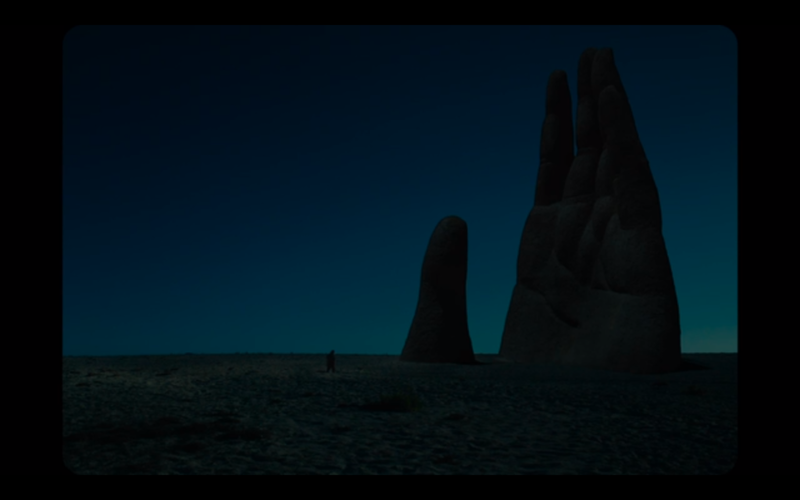 This is the movie where Iranian minimalism meets Chilean magic realism. The blind grave digger represents man’s insatiable appetite for stories. What are the stories of dead? He keeps asking. For him, the lack of the story is oblivion. He is crying while digging the 100th grave because there are no more stories to tell. His life is purposeless. He starts playing in the wedding. He asks the father of bride how bride met groom. His profession changes but his thirst for stories doesn’t. In the end, it’s the story that keeps us going. Stories give meaning to life, or in this case death. ‘OBLIVION VERSES’ WAS SCREENED AT THE 2017 TORONTO INTERNATIONAL FILM FESTIVAL. CLICK HERE FOR OUR COMPLETE TIFF COVERAGE. CAST: JUAN MARGALLO, TOMAS DEL ESTAL, MANUEL MORON, ITZIAR AIZPURU. PRODUCTION COMPANIES: HOUSE ON FIRE PRODUCTIONS, ENDORPHINE PRODUCTION, LEMMING FILM, QUIJOTE RAMPANTE. SCREENPLAY: DOMINIQUE WELINSKI, RENE BALLESTEROS. INTERNATIONAL SALES: URBAN DISTRIBUTION INTERNATIONAL. Deloret Imnidian is a person who wrote this.